Once the survey procedure is complete you should have a mySurvey.txt file available on the data collector. To convert this text file into an Intersense Constellation File (.cfg) you will need to run it through a converter tool. We recommend using Lightcraft’s Constellation Tool available for download from free from Lightcraft’s Download Center. On Non-Previzion Systems, Constellation Tool will need to have a Windows 7 operating system installed in your machine or virtual machine. We recommend the Professional 64-bit version. You will also need to install Microsoft’s Visual C++ Redistributable, available free from Lightcraft’s Download Center. Learn more about Visual C++ Redistributable here. Once the installer goes through, you will need to run Windows Update and look for Visual Studio updates. Microsoft is notorious for their updates and it is always safer to have their latest updates and security updates. Constellation Tool is intended to facilitate the stage survey process and replace all survey python scripts. This is a freely distributed tool intended for Previzion operators to use in their workflow. Please email info (at) lightcrafttech.com for licensing details and our end user agreement. 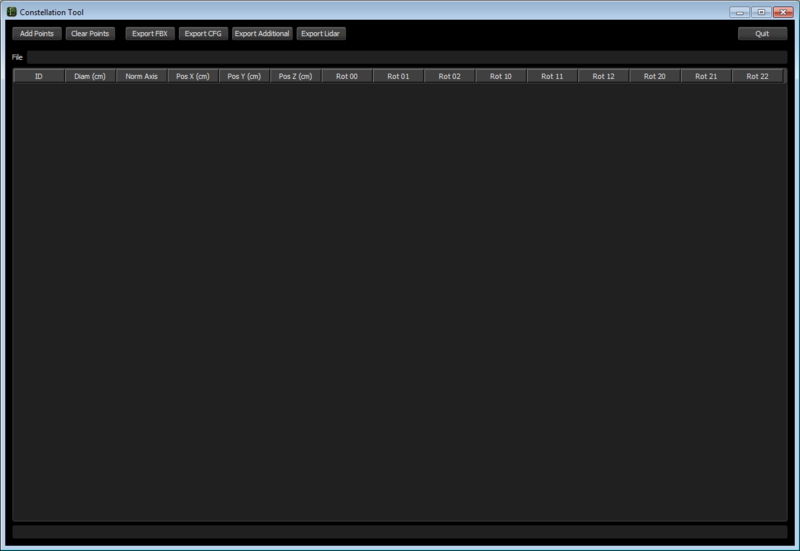 The interface is made up of a toolbar and a table viewer. Export LIDAR (PFTrack Export) – Saves a text file with all points in survey for use in PFTrack’s Survey Solver. Quit – Closes current survey look-up session. “Survey File” is the output file that is generated after each fiducial marker is surveyed with a surveyor’s total station. Total stations are often used in architecture and in construction as a way to measure and verify measurements. For VFX, we use the same tool, but in a different manner. Using a Data Collector, we measure each marker and output the “job” with each point as a list (CSV). The Measured Data columns are the first three. You may use any Total Station and/or data collector as long as it outputs a simple text file with the above mentioned parameters. Can I scale “portable floor targets” and use Constellation Tool? 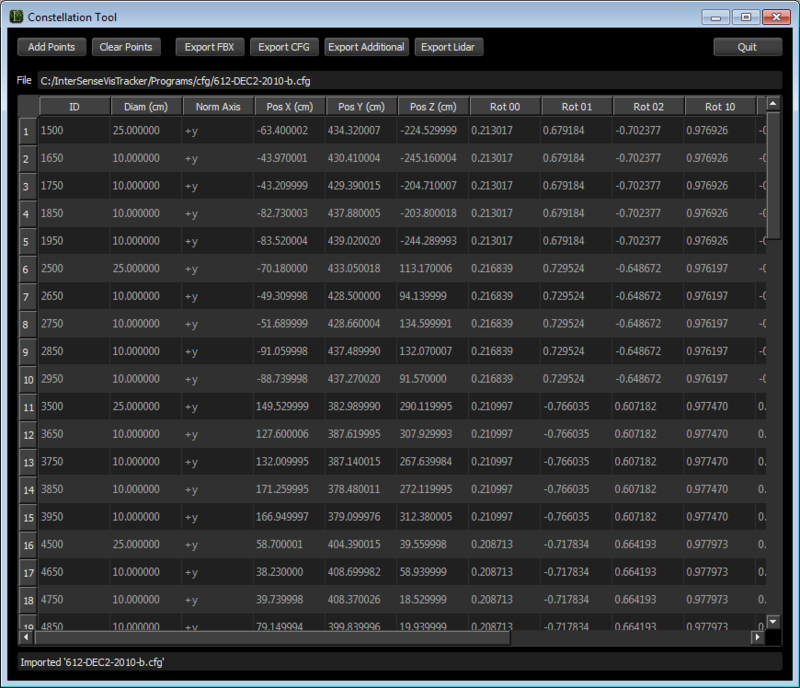 As of November 26, 2014 our latest version of ConstellationTool 8909 to allows for scaling of floor targets. You may scale the 45 point (1.5m) or the 21 point (1m) targets larger or smaller than the original file. Survey the corners fiducial of the scaled target the same as you would a normal size target, then select the appropriate type in Constellation tool. Scaling is done automatically based on the distances between surveyed points on the targets. What if I have more than one type of fiducial markers? As long as all targets are surveyed in the same coordinate space with the same origin, it’s posstible to combine a variety of targets with all kinds of sizes in various positions. When using fiducial marker boards of different sized markers, you will need to keep both sets of markers in the same coordinate space and survey one set of markers first, then the second set. At the time you are exporting the “job” from your data collector, select to only output one set of markers, then the other set as a separate file. In ConstellationTool, you can import the first set of targets, select “use 5 targets” and, when prompted, input the diameters for the respective markers. 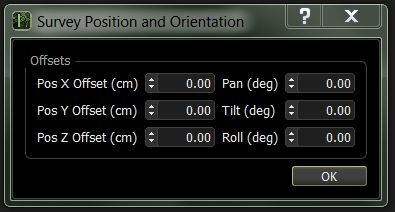 Then immediately after, import the second set of targets, select “use 5 targets” and, when prompted, input the diameters for this set of markers. In very specific applications, mounting “floor” targets on the wall or floor, in addition to ceiling targets, simultaneously, is necessary. It’s easy to combine floor targets to existing ceiling targets. To merge files, simply import to ConstellationTool your original “survey file” (.txt) and re-process it or the already processed “constellation file” (.CFG) for the given location. Then simply “Add Points”, selecting your floor target’s survey file and select the type of floor target. Any duplicate fiducial marker that is on the floor target as well as the ceiling target will be replaced with the one from the floor target, which was the last imported set. This tool will import two kinds of files: txt from surveys and already generated CFG constellations. 5 Target Import – used on surveys of 5-fiducial boards. These are the most commonly used ones on ceilings. 21 Target Import – used on survey of the 42-inch wide portable targets boards. This only require 3 surveyed points for each target board. For more information on using portable targets boards, read more here. 45 Target Import – used on survey of the 60-inch wide target board. This also only requires 3 surveyed points for each target board. Use Additional Points – used to add extra points like garbage matte points, set prop positions, occupy points, traverses and back sights. 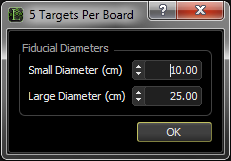 For 5 Target Import, you will be asked to input the diameter of the larger and the smaller targets in centimeters. To merge two or more surveys and/or already made constellations, you may open one survey on top of another. This will simply merge the two and ignore the second instance of repeated points IDs. This means that if a point is used more than once, only the first time it shows up on the table look-up will be used in the final exported constellation. Intersense Configuration File – This is your “constellation” file (.CFG) that holds all the surveyed targets’ coordinates. This is how the Intersense will know where each target is. Cones Scene File – This scene file (.FBX) will have CG “cones” that is used for verifying the survey in Previzion. To learn more about how to verify stage alignment, read more here. Additional Points – For any additional points, like garbage matte points, set prop positions, occupy points, traverses and back sights, Survey Constellation Tool will output a .txt file with their coordinates. Export LIDAR (PFTrack Export) – To use surveyed points (usually set pieces, props or additional references in frame) as seed points in PFTrack’s Suvey Solver, use this export format. This is called “LIDAR” because it’s formatted as a LIDAR survey and it is what PFTrack accepts. For more information about the usage of this format, please refer to our PFTrack post-production tracking refinement page. You may not need to export all three. Most often, all you need is just the CFG and a Cones.FBX to reference from. ConstellationTool 8909 adds the ability to offset and rotate whole constellations. Constellations can be offset in X,Y and Z or they can rotate around the origin in order to compensate for mistakes made during the survey. What version of ConstellationTool should I use? Unless there are custom 5-marker boards being used, please use the latest version of ConstellationTool as we often add new features and improve old ones.